Today on Super Adventures I thought I'd do something wild and play a video game for once. Unreal II: The Awakening to be specific, a first person shooter from the Xbox era, when PC games often came on multiple CDs stacked up on the same spindle to maximise the chances of one of them getting scratched. That's what my copy's like anyway, so I hope it still works. Actually I'm not sure it ever really worked properly for me, as all I can remember about the game is that I stopped playing it early on when it crashed to desktop a couple of times. But I get the feeling I probably could've gotten further in it if I'd wanted to, and now that I'm writing about it I'll endeavour to be more persistent (whether I like the game or not). The original Unreal was co-developed by Epic and Digital Extremes, but they were busy with the Unreal Tournament side of the franchise, so Unreal II: Unnecessary Subtitle was developed by the folks who made the Return to Na Pali expansion pack instead, Legend Entertainment. This was Legend's last ever game before being shut down by their owners, but they'd been around a while and were mostly known for making adventure games. So there's a non-zero chance that the writing might be better than the first person shooting here. I'm not getting my hopes too high for either though to be honest. This week on Super Adventures I'm having a quick look at obscure platformer Tearaway Thomas. 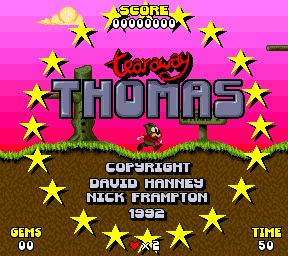 It might seem a bit weird that I'm playing an Amiga game called Tearaway Thomas right after playing an Amiga game called Rolling Ronny last week, but that's because they're both filed away into the same folder in my brain. I'm finally making an effort here to learn which is which and more importantly what they even are. As far as I can tell this is the first and last commercial video game these folks ever made, presumably because it's such an incredible work of art that they decided that trying to follow it up would be pointless and it was best to quit while they were ahead. Or maybe it's real bad and it shamed them into exile. I can't remember, that's why I'm replaying it now.